We are all familiar with some of the amazing helmets that HJC has brought us, especially so from the Marvel scene. We even featured their Captain America, Iron Man, and Punisher Helmets, as well as their Spiderman and Venom helmets. But why stop there when the public demanded Deadpool? Well, they heard our cry and we are proud to introduce the HJC Deadpool and Ghost Rider editions! Designed to be of premium quality, these helmets do not disappoint. Deadpool because of popular demand, and, Ghost Rider because he is an icon in the motorcycle industry. The Deadpool graphic will be featured on HJC’s IS-17 model helmet that features an inner drop down shield. The graphics themselves are well placed, and features Deadpool’s large black eyes that blanket the face of the helmet, with the Deadpool logo placed on the rear. 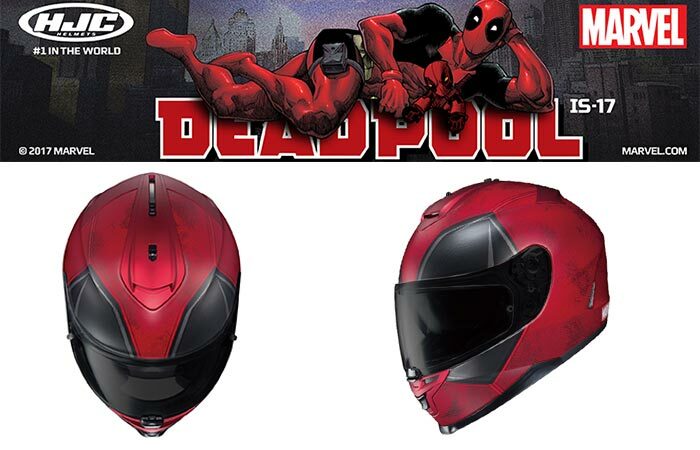 The Deadpool graphic is featured on HJC’s IS-17 helmet that comes with an inner drop down sun shield. Ghost Rider’s graphic looks mean, and incorporates a retro-comic look that include skulls, flames and chains. This design can be found on HJC’s FG-17 fiberglass helmet that is renowned for its lightweight and aerodynamics. 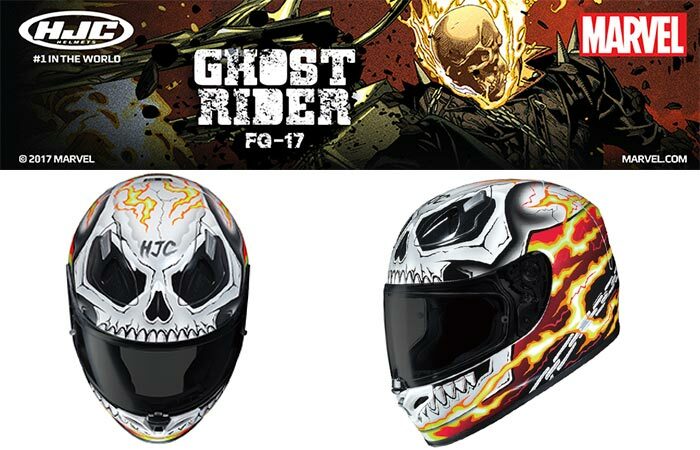 This Ghost Rider graphic is featured on HJC’s FG-17 fiberglass helmet. It’s also lightweight, looks amazing, and is of premium quality. Of course, both of these helmets are of premium quality and come with a variety of unique features that makes them superb helmets, in functionality, safety, and comfort. Deadpool will be available for $299 and Ghost Rider for $309. Get it from HJC here.